Ken Anderson, Crook, Judge, or District Attorney? Williamson County, Texas has always been proud of its “tough on crime” reputation. There are anecdotal stories of undercover drug agents from Austin, in neighboring Travis County, making sure they set up drug buys just inside Williamson County so that the dealers could be charged in the much tougher environment of the Williamson County judicial system. Ken Anderson (left) was the face of that Williamson County system for many years. He served as District Attorney for 16 years and as a District Court Judge from 2002 until his recent resignation and conviction for Criminal Contempt of Court. Depending on who you ask, he was either “upstanding citizen, prosecutor of the year, and local Sunday School teacher,” or he was a man whose sense of values didn’t include the word “justice.” In either scenario, he is now a convicted criminal. Michael Morton was a young husband and father who lived in Williamson County when his wife was brutally murdered. 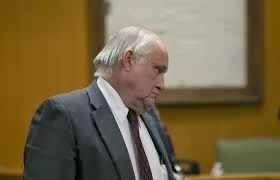 The highly regarded, but incompetent investigator, Sheriff Jim Boutwell, decided that Morton murdered his wife, even though no physical evidence existed to suggest that theory. He and Anderson, who was then District Attorney, made a case against Morton, ignoring and concealing a few facts they learned along the way. 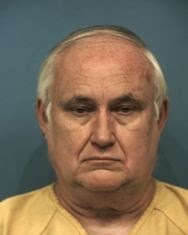 Anderson apparently didn’t think it was important to let Morton and his lawyers know that his dead wife’s credit card was used in San Antonio after she was murdered or that Williamson County sheriff’s investigator, Don Wood, had been told there was a witness who could identify the woman who used it. Also concealed was the fact that witnesses in the neighborhood told investigators of a suspicious green van seen behind the Morton home on the day of the murder. He also concealed details of a conversation Wood had with the mother of the dead woman. She called Wood and told him that her grandson witnessed the murder and said that his father, Michael Morton, was not there when it happened. The child had also described other details of the murder scene which indisputably indicated he witnessed the murder, but ace investigator Wood apparently never followed up. Even more importantly, Ken Anderson (above right) hid this evidence from Morton, who was convicted of murdering his wife. Morton went to prison and Ken Anderson became a judge. After 25 years in prison, the last five of which he fought John Bradley, the man who replaced Ken Anderson as D.A., for the right to test DNA evidence, Michael Morton (left) was cleared of all charges. Lost forever was the ability to see his son grow into a man. He went into prison a young man full of dreams. After 25 years, he came out unbent. Anderson was recently convicted of contempt of court for having hidden the evidence and then lying about it. But his deeds are more repulsive than that. The real killer of Michael Morton’s wife also murdered an Austin woman after Mrs. Morton’s death, a crime he couldn’t have committed if he had been arrested for the previous crime. That murder went unsolved until Morton’s defense team connected the two. The real murderer also committed other crimes in the 25 years before he was exposed. Nearly as catastrophic was that a young child grew to adulthood believing his father, Michael Morton, had murdered his mother. All these tragedies are piled at the feet of Ken Anderson. He served five days of a ten day sentence for his criminal act. Anderson’s no longer a judge and can’t practice law. Many question what that says about Texas justice. 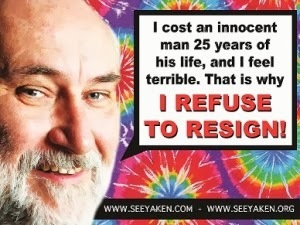 Before his professional demise, groups were calling for his resignation, even starting a yard sign campaign as depicted in the photo above. During the nearly 30 years after he committed the crime, he continued to enjoy all the family freedoms his victim, Michael Morton, was denied. He also continued to practice his brand of justice in Williamson County, Texas. I’ve published a novel, Cheating Justice, in which I describe some of the reasons I believe our criminal justice system sometimes goes awry. The Michael Morton case is one of several such injustices in Texas that inspired me to write the novel. Our law enforcement professionals are usually heroic, but it is important that we not ignore the short-comings of those who soil the profession. Ken Anderson is not an anomaly in the criminal justice system. I've also followed the antics of Galveston County District Attorney Jack Roady who caused Joshua Bledsoe to spend ten months in jail until his trial and then it was exposed that Roady and his prosecutors had withheld both the 911 call that contradicted their star witness and refused to obtain his cell phone records that proved he was not even in the same county at the time of the crime. Roady also abused 17 yr. old Fred Mueller, charging him with felony intoxication manslaughter and dragging him through hell for more than year even though he knew his blood alcohol level was .01. Anderson should have been placed in the same cell he put Mr. Morton in and Jack Roady should be UN-elected in 2014. Anderson deserved a lot more jail time than he got. When cops and prosecutors exploit their power and act without regard for the law, then it diminishes the whole justice system. It happens, and they should pay a high price when caught. Such behavior sends innocent people to jail, a tragedy beyond words. Good piece, Larry. I am wondering what happened to Sheriff Jim Boutwell. Is he dead? Is that why he wasn't punished for his own malicious behavior? Larry Responds: Boutwell is deceased. He was also a part of the Henry Lee Lucas mass murder fiasco in which Lucas confessed to Boutwell for many crimes he apparently didn't commit.